Generally a double garage will be 6.5 m wide. But the size will be on your plans. Measure what you have and compare the dimensions. You’ll soon see whether your builder scammed you! You seem competent. I see many garages built directly at boundary wall and not leaving 1.5m. Is it old rules? I would like to extend/move my existing garage to the boundary wall. Can I use it for other purposes, must the “garage” not have any windows and a maximum height or what regulations apply? It varies and depends on the building line for the property. This should be indicated on the site plan for the property, and on the original drawing when the area was surveyed (which you can get from the Surveyor General’s office in Pretoria). But the local authority can give permission for a garage to be built on the boundary, though you would need to get permission from neighbours if the building line is changed. To extend or build a garage, you will need plans. All the NBR apply in terms of H4, which is a “dwelling house – occupancy consisting of a dwelling uni on its own site, including a garage and other domestic outbuildings, if any”. Plans will have to be drawn up by a “competent person” (CLICK HERE to read more about competency) who will advise what is required in terms of height, light and ventilation, fire walls etc. If the plans state that this is a garage, technically this is the only purpose it may be used for. However many garages are built either with additional space for storage, or are in fact used for storage. The two issues are “habitable rooms” and probably also rates payable to council. e.g. You cannot “live” in a garage, because it isn’t built for that purpose. Thanks. Surely I won’t do it alone but knowing options beforehand helps alot. So a workshop, garage or hobby room would be allowed as long as you don’t live in them? I have just heard that those rules are going to change in March 2013. Do you know about that? That’s not quite what I said. Basically plans include a description of “purpose” or function. And technically that is what the structure or room is for. Which rules have you heard are due to change? Let me know and I’ll find out. The NBR has only just been updated, and unless there are new parts, I doubt that there will be changes at this stage. We have people building a new house on the raised stand behind us. They have requested permission to build the double story house to less than a 1 meter from our boundry wall, behind the boundry wall is our small paved entertainement area that flows into our house. I am concerned about the rain water flowing off the roof into our patio and damaging our house. What is safe distance for the double story house to be built to prevent rain overflowing. I would also be concerned that they would look straight onto your patio! But to answer your question… It is not so much a safe distance that you need to worry about, but an assurance that their drainage will be properly designed. We have recently been inundated with messages and queries from people whose neighbors blatantly build and alter boundary walls and then take zero responsibility for damage caused when they collapse or there isn’t proper runoff. Rain water needs to be channelled by gutters and downpipes into suitable storm water drains that run off to a municipal drain – and NOT onto your property. I would like to know if the municipality can insist that the dimensions of a toilet inside a house be at least 2m in lebght irrespectively of the width? Adri they probably can, depending on the local authority’s interpretation. The NBR deemed-to-satisfy rules state that the minimum plan area of any “habitable” room must be at least 6 square metres and have no linear dimension that is less than 2 m. The only exceptions are kitchens, sculleries and laundries. But they don’t specify minimum size of toilet spaces. I thank you for the response. Habitable room description does not include a toilet according to what I read. Does this then mean that the mun. can not actually do this. You are right in terms of the definition of “habitable room”. The legislation defines this as “a room used or designed, erected, adapted or intended to be used by persons for sleeping in, living in, the preparation or consumption of food or drink, the transaction of business, the rendering of professional services, the manufacture, processing or sale of goods, the performance of work, the gathering together of persons or for recreational purposes”. And the legislation states only that, “The floor area of any dwelling unit shall not be less than that necessary to provide one habitable room and a separate room containing toilet facilities. So I think you have a strong argument. As a matter of interest, I just measured the guest loo in the house where I currently live and the room measure 1,7 m x 900 mm! Adri, if they are dog-headed about the issue, put in an objection in writing. Good luck. Minor building work [CLIK HERE to read more about this] does not required plans. BUT – and this is important – the National Building Regulations say that you must still notify your local authority that you are going to undertake minor building work. Like all other structures covered in the regulations, a “prefab wooden room” would have a purpose or function – and it needs to be built for this purpose. Minor building work does NOT cover living quarters. It does, though state that if a tool shed is smaller than ten square metres, it qualifies as “minor building work”. So you would be within your rights if you erected the “shed” IF it was under ten square AND you notified your local authority of your intention to erect it. There is another issue, and that involves “temporary buildings” which may be erected without plans and used for a specific period of time – agreed by the local authority. However in this instance the regulations say that you need to submit SITE PLANS and general LAYOUT DRAWINGS as well as state what it is for and how long it will be used. It doesn’t state how long you may have a temporary structure for – but builder’s sheds are precluded. My suggestion is that you submit a letter to your council to say that you have undertaken “minor building work” and have only now realized that you should have notified them of your intention to erect the shed. Specify what sort of structure it is – you will see what is allowed in the link above. If you are using the shed as a dwelling, it is very likely that your neighbour could have it pulled down. If you are using it as a tool shed (or garden shed) you shouldn’t have a problem. Good luck. Is there any scope for alternative building techniques in South Africa? For example earth bag, cob, strawbale etc. Also interested in the American “tiny house” movement. Looks like these buildings might be illegal in SA. Yes Tim there is, and there are examples of all three you mention that have been built perfectly legally in this country. 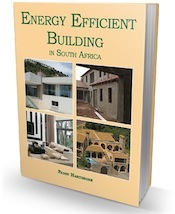 I think that half our problem – in SA that is – is that we can build with blocks and mortar very cheaply. We generally don’t bother with energy efficiency either. Where can I find out how much of my property can be built on (R.O.C) is? Cheryl there are building lines that the local authority will impose. For instance you can’t usually build less than 1.5 m from a boundary. This will determine the area on which you can build. There isn’t a set %. Trust all is well. We are looking at building a 36 square/m garage (double garage) next year. If possible could you please advise what the estimate cost of such a project is. Looking at using normal bricks or blocks and a normal roof. So plain-jane… We looking at just getting the structure up and we can modify as we continue to live on the property. At the moment we have a carport which is not working for our needs. It would really be appreciated if you could assist. We’ve been searching the net but most blogs are out dated. Your blog is the most recent I’ve come across. Many thanks for empowering us with knowledge. Yolanda, there are so many factors that come into play – cost of bricks or blocks – cost of cement and sand (and crushed stone for foundations). Cost of timber. Type and cost of roof covering. Labour costs. Probably the cheapest route will be to use concrete blocks and corrugated iron sheeting (so that your trusses can be relatively lightweight). Remember that you are going to need professional plans to be passed by your local authority – and a “competent person” will need to submit these for you. A draughtsman is likely to be the least expensive option; and he/she would probably be able to give you a pretty accurate guesstimate of material and labour costs in your area. Here is a link to a story I wrote recently for an American website on small house building. It might be useful in terms of estimating. I also have a chapter on quantifying and costing in my updated book on Owner Building in South Africa. sq metre pricing to build, tile roof or zink sheeting. The Home Owners in this estate require the height of my two lateral boundary walls on the excavation leading down to a marina to be measured from the “general height of the ground level, natural or engineered by the original developers, where the wall was built”. To alter the walls would cause me great expense as they are unfortunately already built. They say the relevant “Architectural Guidelines” for this development which state only “All heights measured from datum 3m above msl.” applies only to to houses. I think that “msl” is legally meaningless. If they are correct where can I find legal authority for the exact way the walls should be measured? My municipality is not prepared to lay out this information for me. To be honest, I had never heard the term mean sea level (msl) until now. I presume this has been used because the development is right next to the sea. But what is the issue here? Is it the height of the walls (are they too high)? It also isn’t clear from what you say whether you or someone else built the wall, and when. If there are architectural guidelines for a development, this is the “legal authority”. It over-rides anything that the municipality might require from builders outside of the development. If there is nothing about walls other than those of houses, I would imagine that there could be some sort of precedent that relates to what other home owners have done/been allowed to do… unless of course this is a new development. My advice is to get a copy of the guidelines and track down the architects who compiled them. They should be able to help you. I am in the process of buying a 550 square metre building site. What is the maximum size of house that I am permitted to build on this size stand? What is the minimum size of windows and doors allowed for a room? Is there a calculation formula? 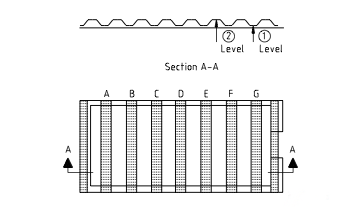 SANS 10400-C specifies dimensions of minimum room areas and heights. 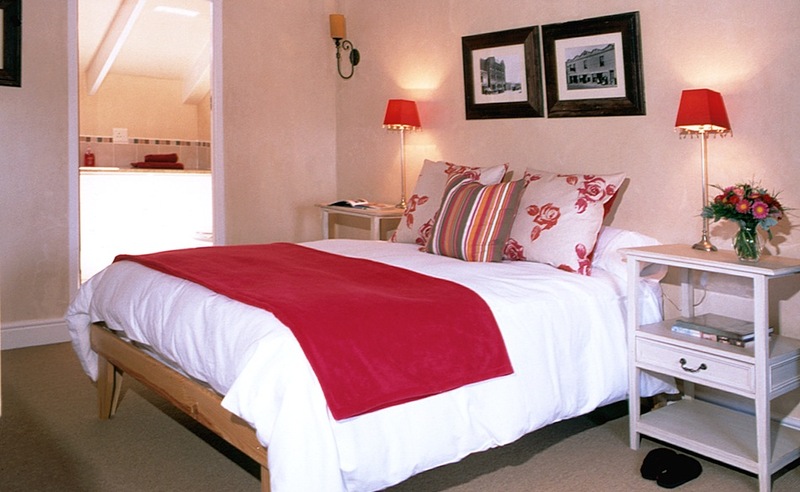 Part O covers lighting and ventilation (both natural and artificial) – http://sans10400.co.za/lighting-and-ventilation/ – which relates to doors and windows. For the rest it really relies on design criteria rather than regulations. What is the minimum width of a door way or door opening. And where can I find more detail in this regard ? Hi. You found the right place on the site for dimensions, but the National Building Regulations and NHBRC guidelines do not give specs for doors and openings. Generally designers base their plans on standard door frame sizes. 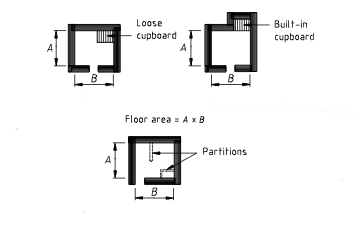 Based on this, an opening wouldn’t be less than about 700 mm wide, which is more or less the opening size from the inside members of a door frame. i just recently purchased a new car (average – Hyundai sonata) and realized that it does not fit my garage (3m wide, 4.3 m long). As i am a tenant, i would like to know if there are any legal building regulations that regulates the minimum size of a space deemed fit for use as a garage? SANS 10400 does not give any minimum dimensions for garages. That’s an interesting one Sylvie. Part C of the Building Regs gives minimum dimensions for rooms and buildings, but as you have probably realized, the focus here is on habitable spaces. The dimensions are small and intended to be guidelines for “affordable” housing – as well as “fit for purpose”. So if someone builds a “tiny” garage for their mini, I doubt that there is anything to stop them. Some local authorities may insist on a specific minimum size for a garage (you could check with yours); private housing developments might too. But anyone renting/leasing a property, does so knowing exactly what they are going to be renting. So I am going to stick my neck out and say you don’t have any recourse. I wonder if you could help me with a garage question. I’d like to build a double garage on my property, what would be the absolute minimum size we could build to? We have the length but width is a bit of a problem. You should be guided by the size of the average car. You need to be able to park two cars side by side – and open doors without bashing the adjacent vehicle. A double garage may be built with two single doors, or with one double door. So you can also be guided by the size of standard garage doors. The length – or height – of both is generally 2130 (i.e. just over two metres). Single garage doors are 2440 or 2450 wide; and double doors, 3000 (roll-up) or 4880. Some double garage doors are as wide as five metros +. If you can’t accommodate a double garage width wise, perhaps you could build one that accommodates two cars tandem. It’s not ideal, but it might be a solution.